Your mind and beliefs have the ability to shape your future and the outcomes you create. In today’s episode, Jean focuses on the three main components that will take you from a fixed mindset to one of growth and abundance. Attitude is everything when it comes to achieving your goals. It’s a decision that will impact your performance and the results you generate. Most people ‘think’ they’re going all in but in reality, they’re not. They aren’t going ‘All In’ with their mindset and don’t truly believe in what they’re doing. Self – limiting beliefs will rob your blind from living your best life and building a profitable online business. Your beliefs create your reality. 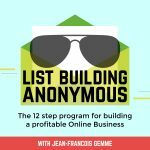 Whether your limiting beliefs are coming from money, sales or even success, it’s important you remove them before you move onto the next step in Jean’s 12 step process. 98% of the population are either broke or dead by the age of 65. If you want to set yourself apart, you have to surround yourself with the ‘two percenters’. These are the rare people who have mastered their mindset, removed all limiting beliefs and go all in no matter what they set their mind to.